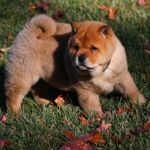 Though I agree that crate training is great for a lot of dog breeds and very convenient for dog owners, I am not convinced that it is the best for Chows. 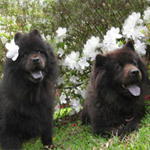 Having grown up with Chows, we never crate trained them, and they were just fine to roam the house. I found that all of our Chows liked to roam the house at night and check on all the bedrooms periodically. That's something I really like about them, and I feel like it goes against their nature and defeats the purpose of having a protective, loyal dog if they are crated. But whenever I talk to a dog person about the fact that I don't want to crate train Beau, they gasp at the thought, but then again, none of them have even encountered a Chow. Most of them have dogs like labs or golden retrievers who do not have as much of that protective nature. Also, a lot of them say, "you think he's cute now, but once he's big, he's going to be all up in your bed, and you won't have any space and he'll chew up the cabinets in your kitchen." But this has never been my experience with Chows. None of our Chows liked to sleep in the bed, even when I as a child wanted the fluffy thing to cuddle with me, and none of them were big chewers. I know that dogs are similar in a lot of ways, but it's hard for me to accept that crate training is universally good for all dog breeds. Am I out of line to be thinking this way? We've had Beau for a little over 2 weeks now, and so far little Beau is doing well sleeping in his dog bed at night by our bed. He doesn't wine unless he's letting us know that he needs to go outside, which is usually right when we're getting up anyways. He seems to roam around sometimes at night and may play with our cat on occassion, but typically he's pretty quiet and content sleeping down there. As far as the day goes, my husband and I both work full-time, so we're gone betwen 7:30 and 5:30ish Mon-Fri. My younger sister is living with us currently, and she is able to watch him during the day. And in the event that she can't, I have been dropping him off at my twin sister's house. They have 2 young children, an American Eskimo, and a cat, so it's great for socializing purposes. I'd much rather do that than crate him for 10 hours during the day and another 6-8 at night, you know? My sister won't be living with us forever, but by the time she leaves, I'm hoping we'll have a well trained dog who knows how to hold his potty and restrain from messing up the house, plus be a useful guard dog in the event an intruder ever tried to enter our home. 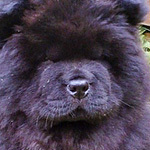 With that said, I'd like to hear what any of you experienced Chow Chow owners have to say about it. And also I would love to hear suggestions that any of you non-crate people might have that have been successful. I think that it all depends on both your purpose and long term thoughts on your Chow. 1st off, crate training is simply that...training. As a young pup you are providing him a safe-zone, and a 'home'. The concept is to eliminate mistakes throughout your house. By restricting his space (for now), the pup associates the crate with his own space and will not want to dirty it thereby 'holding' it when he may not otherwise be so inclined. For a young pup, it also keeps him out of trouble. There is no furniture to chew on, no extension cords to play with, and no poisonous cleaners to drink down. It also can help with separation issues and teach him that he is OK when away from you. None of that says it is a permanent arrangement. Certainly as your dog ages he will want to protect your house, not just his. I would not recommend crating an adult dog on a regular basis for 10 hours a day. There are many reasons a dog may need to be crated and he should be adapted to that scenario. If he requires and overnight vet stay, at the groomers, if he suddenly needs to be boarded if you travel, if you have visitors in your house that don't agree with him or are afraid of dogs, if you decide to show the dog, longer car rides, etc. You don't want a chow that freaks out if suddenly confined in that manner. Best to have him used to a crate and is comfortable with it. I do show both my dogs. They are accustomed to the crate. The are in a crate for every car trip (it really is safest for them). They were in crates overnight as young pups until potty training was complete. During the day, they were restricted to a room and that space expanded as they aged and learned the ropes. At home, we still excercise the crate about 1x a week. They get a toy and a chew treat and just hang out for about an hour or so. They end up getting 'alone time' from each other and just relax. With good training, they also understand their space. My male used spend about 5 minutes a night on the bed with us. Good bonding time, then he was done and he would ask for off. We restrict him jumping onto the bed and our household stairs (polished wood, very slippery, and bad for Chow joints). Our female is a little more graceful and she is allowed onto the couch, but still not the stairs to the 2nd floor. I bought a crate with the intention of training him to see it as a den. He has no problems going in and a few times has even voluntarily napped in it, but I've never actually locked him inside the crate. 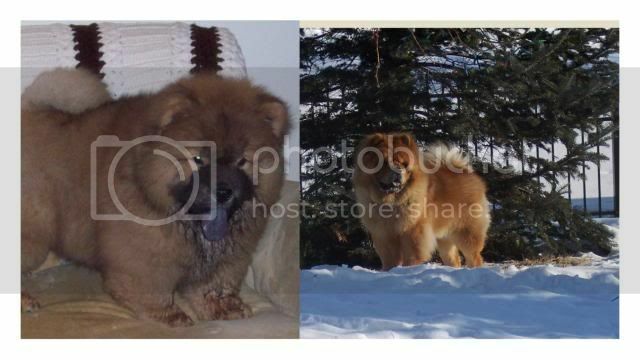 My situation is similar to sarahbeara's in that my Chow is rarely left unsupervised. He's almost 19 weeks old and has been house trained for many weeks, so that's not an issue. Neither is chewing on furniture or other such destructive behavior. So in my particular case I don't think I'm going to push crate training any further. I don't plan to ever leave him overnight anywhere except the vet (and will try to even avoid that). He won't like that regardless if he's crate-trained or not. Again, this is specific to my lifestyle and yours may be different. Rory's Dad listed a number of situations where a crate-trained dog would be happier, so consider if any of those would apply to you. You wouldn't be confining him to the crate unless it was necessary; it wouldn't be something you did regularly at home once your pup is properly trained. The question is whether those exceptions (travel, groomers, etc.) will be frequent enough for you to pursue crate training. Crate training helps them learn to relax and chill out if ever they need to be put in a crate or kennel. You can still kennel or use a crate on them later in life but they are more likely to be more stressed out . We only crated Brutus at night with us in our bedroom until he was about 9 months old and at shows. But have gone on week long vacations and had to put him in a kennel. He wasn't stressed out at all because of being crate trained. Remember life changes and even though you don't need to do it now it doesn't mean you won't in the future. Examples like weddings, funurals, family reunions, vacations and I could go on and on. Brutus is the only dog I've had that has been crate trained and will continue it with all future dogs. But there is no right or wrong way to raise a chow, but choices just like raising kids. God forbid that it should ever be necessary but although mine don't spend time in a crate now they are all fairly content to locked in if needs must. Bramble tore not one but two cruciates and that ability to be confined for periods when I couldn't be sure the postman or the window cleaner wouldn't arrive and cause her to go mad and undo all the good (and expensive) work of the surgeon was something I was so glad I had taught her. Now we have another scenario where one of them needs to spend time for a while under close supervision and again I am glad that my chows will hop in a crate happily to eat their food and not loose it when the door is shut. Normally the crate is in the garage but I am very glad my girls know its not a punishment just something that happens sometimes! I taught them as young puppies that they got fed in the crate and got chews in there so if they thought food or treats were on the go they ran and jumped in. The the door was shut while they ate and sometimes after a long chew they just went to sleep on the blanket and I would let them out later. No trauma and no upset just something that happened like going outside or being groomed. I have not crate trained my dogs, but know people who do, and would have no problem with it. When Ursa was small, she would search out a "den" to stay in. The last one was behind the Lazy boy recliner. It was covered with a sheet to keep off the cat hair, and the sheet hung down in back giving her a place to stay. Just because that is the way we have done training, we use their "bed" as a non restrictive crate. Now "bed" might mean a throw rug over in the corner, but it indicates a location where the dog can go to be safe and out of the way. We use it to separate the chows and the little dogs, especially when the little dogs get excited about something. The little dogs are up on the couch or the recliner on a small dog bed, where they have the advantage of being up, and the chows are on mats on the floor. Everyone knows where to go and no one is in someone else's space. This is a practice we started 40 years ago. Sirchows comments reflect what a Dobbie trainer/breeder friend would do. Her thought was that it gave the dog a sense of having an "exclusive" place that was all his or hers, a real ego booster. i find Chows easy to house break and that is probably the only reason I'd use a crate. i do use doggy fences to keep him in/out of certain areas but do not like the idea of enclosing him in a crate. Chance was introduced to the crate from day one. He had short periods in it with treats. I set up a play pen around a small crate and he would crawl in and nap when he was wore out. This gave me time to do things around the house and not worry about him piddling on the floor or getting into something that would hurt him. Withing a few weeks to a month I expanded his play area and gave him more space. Again this was for unsupervised play and nap time. He was out with me most of the day because I was lucky enough to be able to take him to work with me. At work he had a crate with the door open and my office had a puppy gate. From time to time throughout the day I would put him in the large crate at work and give him a kong filled with treats to play with. Like Rory's Dad, Chance goes to dog shows and has down time between ring time in his crate. If he wasn't crate trained I would never be able to potty at the shows. He is seldom crated at home, but at night time I do puppy gate the dogs in separate rooms and give then a treat to settle down with every night. Otherwise they would be up and down the stairs all night, wrestling and carrying on. All my pups are crate trained and love their crates. After about 2 months we don't even have to close the doors anymore unless we leave the house. They sleep in there, and have their alone time. They have all taken to it very well, but my chow and chow mix specifically have seemed to love the crate more than my lab mix. I don't think there is anything wrong with crating your pup as it is supposed to be their den, not jail. Always make the crate fun when you introduce it, and don't ever make it a punishment unless it's for 5 or less minutes. Crates don't break an animal, it gives them a safe spot to chill out in your house. You have a room, and so do they good luck!